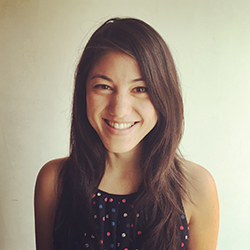 Sanette Tanaka is a product designer at Vox Media. Currently, she’s working on the publishing platform and content management system that powers the websites of their editorial brands. Before that, she led design on Vox’s first experimental product team, where they worked with emerging platforms, technologies, and interaction patterns. She has designed (and coded) apps, websites, games and voice products. Before she designed, she reported. Most recently, she was a real-estate reporter for The Wall Street Journal, and continues to write on a freelance basis. She believes her journalism background has been instrumental in shaping her investigative, user-centered approach to design. Tanaka graduated from Duke University, and earned a master’s degree in Creative Digital Media from the Dublin Institute of Technology as a George J. Mitchell Scholar.